Okay, so I am partially ignoring my own advice regarding the Halbig/PPACA debate. Yes, I said that we should not get distracted by side-show arguments like what some guy said on video two years ago. But I also said that if we’re going to get the better of this argument, we actually need to engage with the claims the other side is making. Enter this morning’s article on Talking Points Memo: “BOOM: The Historic Proof Obamacare Foes Are Dead Wrong on Subsidies.” Perhaps this CBO-based argument is a bit of a side-show, or perhaps not. But either way, it’s a great example of a supposed counterargument that wholly misses the point of the conservatives’ legal claims and is therefore wholly ineffective at actually advancing the liberal case. Congress surely would have noticed if the CBO ever modeled the law with the assumption that some states wouldn’t have access to the subsidies because they were using the federal exchange. [T]he CBO never did one thing: It never considered that subsidies would be unavailable in some states if they didn’t set up an exchange, as Auerbach told TPM this week. In all its iterations of the law, the idea that the subsidies would be available nationwide permeated all of them. And those are great arguments! They certainly support the liberal narrative that everyone understood the subsidies to be available on both state and federal exchanges. One problem: The supposed “BOOM” facts also support the conservatives’ competing narrative. Conservatives contend that the drafters, and the press, and Congress, and the CBO (i.e., everyone) assumed that the PPACA’s threat of “build these exchanges or else you don’t get subsidies” was so strong, that every state would create an exchange. There would be no need for the federal fallback to actually provide anything. In that world, the CBO could assume that “the subsidies would be available nationwide.” So the TPM article does no damage to the conservatives’ position. In other words, it’s not enough of a counterargument to say “Look at how well these facts fit into my narrative of the events!” An effective counterargument must say “Look at how these facts do not fit into my opponents’ narrative.” The TPM “BOOM” fails in this regard. So what would an actual counterargument on this point look like, if we actually wanted to engage with the conservatives on the CBO budgeting point? Well, one of their main points—repeated constantly—is that we know the CBO assumed states would create all the exchanges because the CBO allocated zero funds to the creation of a federal exchange. Accordingly, the CBO assumed everyone would get subsidies under state exchanges because it assumed there would be no federal exchanges. An effective counterargument on the CBO point must therefore address that core assumption. Did the CBO really assume that the federal government would not operate exchanges? Because if we could show that the CBO did contemplate federally run exchanges, and that regardless the CBO assumed that everyone would be eligible for subsidies regardless, then I think we may have something! So what do the conservatives point to as evidence that the CBO never contemplated federally operated exchanges? I’m certainly no expert on the PPACA debates or the merits of this litigation, but looking at the Adler/Cannon article (the ur-text the Halbig case) it appears the main support for this claim is a 2010 letter from the Director of the CBO, a Cato Institute blog post by Cannon himself, and a Politico article or two. Can we do better? I’m not sure. Confession: I’ve never read a full CBO report and I’m not familiar with the details of these sorts of documents. But I looked through the March 20, 2010 CBO estimate of the spending effects of the Reconciliation Act of 2010. Again, I’m veering out of my lane here, but what to make of this statement in the report? A few billion here and a few billion there seems to be about right for how much the federal government would need to operate some exchanges. Again, these clips from the CBO report may be totally useless. But my main point is this: if we want to actually convince anyone on this Halbig/PPACA point, we need to do more than show that our narrative fits with the facts; we need to show that their narrative does not. And to do that, we’ll need to undermine the core assumptions of their arguments. Showing that the CBO assumed everyone would be eligible for a subsidy just doesn’t do that. 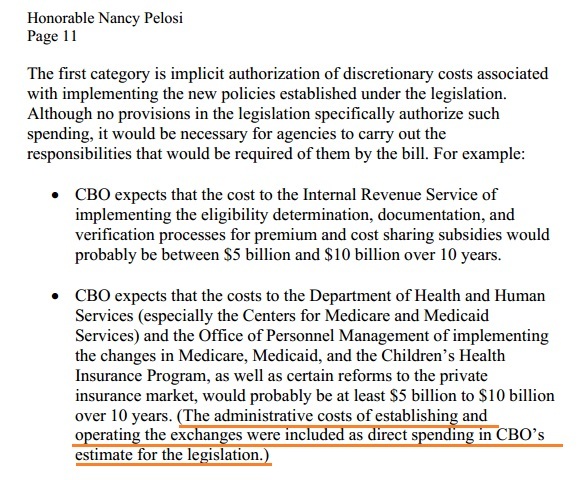 Update August 2: If you’ve been sent here by Instapundit or Redstate, and you’re just reading this one post at Ziffblog, you might think that the CBO analysis is some sort of critical issue in this litigation. It’s not. As I’ve argued here, the most effective arguments are likely to be based on the text and context of the statute. And to make those arguments effectively, we on the left need to engage with the textual and contextual arguments advanced by the challengers. The TPM “BOOM” post aside, there are plenty of folks on the left making these arguments. It’s not like we don’t have good textual and contextual arguments on the left! For one, read the Court of Appeals decision in King v. Burwell starting on page 15. And when you’re done, head on over to the Incidental Economist to read Nicholas Bagley’s multiple posts on the subject. The statutory text and the legislative history is a bit of a mess with the ACA. So this is a tough case for both sides. More important than any side issue about the CBO, the critical point here is that folks on the left and the right do themselves a disservice by thinking the answer is obvious or that this case is easy. This is really pathetic. The text says “enrolled in through an Exchange established by the State under [§]1311 of the [Act].” BY Not “on behalf of”. The dissent attempts to supply this missing equivalency by pointing to section 1311(d)(1), which provides: “An Exchange shall be a governmental agency or nonprofit entity that is established by a State.” 42 U.S.C. § 18031(d)(1). According to the dissent, (d)(1) means that an Exchange established under section 1311 is, by definition, established by a state. Therefore, the dissent argues, because federal Exchanges are established under section 1311, they too, by definition, are established by a state. Thanks for the comment Greg, and for the link in your site. I certainly agree that the challengers have answers to the government’s position. And the government has replies to the answers, and so on. I think there are a lot of interesting/messy textual and contextual arguments on all sides. The tough part for the challengers, however, is that they need more than to just have the “better” of the argument—they need to have their reading be the only reasonable reading. And I’m just not willing to go that far in light of how the phrases “Exchange” and “Exchange established by the state” are used throughout the Act. As long as there’s some reasonable ambiguity there, Chevron says you’ve got to go with the IRS interpretation. Our obligation to avoid adopting statutory constructions with absurd results is well-established. Under this principle, we will not give effect to a statute’s literal meaning when doing so would “render[ the] statute nonsensical or superfluous or . . . create an outcome so contrary to perceived social values that Congress could not have intended it.” But we do not disregard statutory text lightly. The Constitution assigns the legislative power to Congress, and Congress alone, see U.S. CONST. art. I, § 1, and legislating often entails compromises that courts must respect. See generally John F. Manning, The Absurdity Doctrine, 116 HARV. L. REV. 2387, 2434-2435 (2003) (warning that an overbroad application of the absurdity doctrine “contradicts the rule-of-law objectives implicit in the Constitution’s strict separation of lawmaking from judging”). We therefore give the absurdity principle a narrow domain, insisting that a given construction cross a “high threshold” of unreasonableness before we conclude that a statute does not mean what it says. A provision thus “may seem odd” without being “absurd,” and in such instances “it is up to Congress rather than the courts to fix it,” even if it “may have been an unintentional drafting gap.” (“Because our role is not to ‘correct’ the text so that it better serves the statute’s purposes, we will not ratify an interpretation that abrogates the enacted statutory text absent an extraordinarily convincing justification.”). The government urges us, in effect, to strike from section 36B the phrase “established by the State,” on the ground that giving force to its plain meaning renders other provisions of the Act absurd. But we find that the government has failed to make the extraordinary showing required for such judicial rewriting of an act of Congress. Given that the Supreme Court just decided the EPA case saying in effect “it’s not our job to clean up what Congress writes, and the Executive branch can’t do it, either”, once you concede that the plain text of the law is on the challenger’s side, it is you who have to prove that the “plain text reading” is nonsensical. Admittedly I’m on the other side from you, but it looks to me like the Halbig court pretty much tore to shreds the excuses the King Court used to create “ambiguity” where none exists. “On behalf of” != “by”. Do you really think that Roberts or Kennedy is going to rule that it does? Because lacking those two, you’re toast. No? This is the Cleavon Little School of Gentle Persuasion: Thinking that “Blazing Saddles” is a documentary and thinking that the Democrats would hold a gun to the head of the poor and needy in the hopes that prion-infected Republicans wouldn’t do anything stupid that would hut those poor folks the Republicans always care so deeply for, and then thinking that these same prion-infected Republicans would do as did the townsfolk in “Blazing Saddles” and stand down…. No. No. A thousand times no. ‘reasoning’ Republicans ascribe to the Democrats (instead of asking, oh, what do the Democrats say they had in mind…) doesn’t change the fact that it supports the sea that the tax benefits were intended to be available to all. This is important because it is dispositive: It is only the Republicans that are saying that the tax benefits should not go to people in federal exchanges. Everyone else disagrees. That’s what Republicans sued for, and that’s what the administration and everyone else is fighting. If Democrats and the CBO assumed that everyone would get them, then the denial of benefits to people in (the necessarily non-existent) federal exchange can’t have been the intent of the law according to them. Which is why Congress would not have DREAMED of telling States that if they didn’t expand Medicaid, they would lose ALL their Federal Medicaid money. Oh, wait, Congress did exactly that, IN the PPACA. And the Obama Administration fought all the way to the Supreme Court (and lost 7-2) to make that threat stick. So your argument appears to be completely lacking. No? While the Federal Government might be able to act “on behalf of a State”, it’s actions are actions done by the Federal government , not “by the State”. That’s only “ambiguous” if you’re desperate for the answer to come out the wrong way. Or, to put it another way, if that is really “ambiguous”, then so is every other law on the books. And while may be happy with that outcome, there are five members of the Supreme Court who less than two months ago clearly established that they are not in favor of that happening. Oh, wait, Congress did exactly that, IN the PPACA…. There is a difference between Medicaid grants to the state and tax subsidies directly to the people who need it. Medicaid comes as block grants, and the federal government can see fit to not give that money to the state … if the state is not willing to use it in the manner specified, such as using it to pay for poor people’s health in the manner the federal government would like, instead of, say, feathering politicians’ pockets…. This is like Cleavon Little threading to shoot the townsfolk if they are stupid enough to try and hurt the n*gg*h. But, as I pointed out, that’s not what he did. And it is not what you Republicans claim the Democrats did. That being said, Republican state governments were stupid enough to turn down free Medicaid money … perhaps because they couldn’t grift it, eh? You tell me. And the Obama Administration fought all the way to the Supreme Court (and lost 7-2) to make that threat stick. Huh? What’s your point? And what does that have to do with the price of tea in Sri Lanka? Assuming your conclusions is a fine way to win ‘arguments’. Did you see Ziff’s other post? Care to try and answer his questions 1-8? Shouldn’t be a problem for a textualist like yourself…. 1: No I’d not seen David’s follow on post. Thank you for pointing me to it. 3: I didn’t assume what I wish to prove, I stated it, then proved it. Something you acknowledged by not even trying to address any of my arguments.